Ruby red pomegranates are in season! 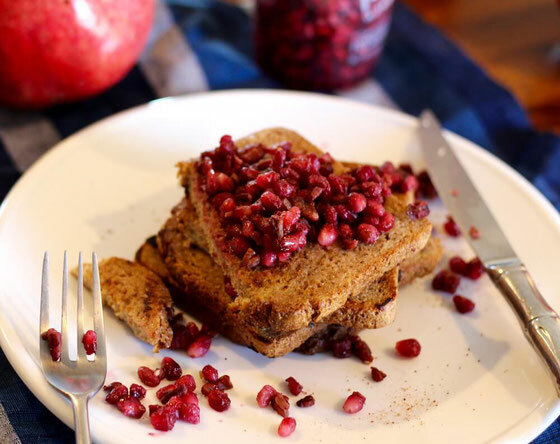 Pomegranate arils are filled with fiber and add a delicious crunch to French toast. I look forward to pomegranate season every year, which starts in October and goes through January. The seeds of the fruit, called arils, are so crunchy and juicy. They're healthy, too: They're bursting with antioxidants and satiating fiber. One of my favorite foods is French toast (you might have noticed the many other French toast recipes on my site, such as my Protein-Rich Cherry French Toast and my Baked Butternut Squash French Toast). So I thought why not add one of my favorite fall foods to one of my most-loved breakfast eats. I played around in the kitchen this morning and came up with the ultimate fall-flavor French toast. First, I whisked some eggs and combined them with almond milk, pomegranate juice, and nutmeg. 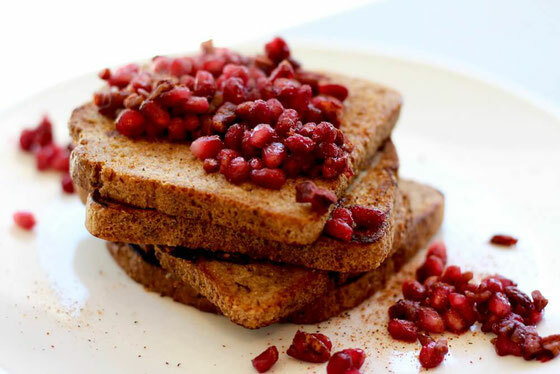 While I started cooking up my French toast, I began pan heating pomegranate arils and pecans with pomegranate juice. The pomegranate arils, pomegranate juice, and vanilla extract offer plenty of sweetness without the need for any added sugar—and the juice adds a moistness that replaced the need for syrup. I served the finished product to my boyfriend (who loves pomegranate season, too), and he was a huge fan. Want more ideas for cooking with pomegranates? Whip up my Pomegranate Pistachio Chia Pudding and my Pomegranate Crunch Dark Chocolate Ricotta Cups. Whisk eggs in a small bowl. Combine with milk, 1/4 cup juice, and 1/8 teaspoon nutmeg. Dip bread into egg mixture, turning to coat sides evenly. Spray a large non-stick pan or griddle with spray oil, and heat bread slices over medium heat until browned on both sides. Meanwhile, heat pomegranate arils, pecans, and remaining pomegranate juice in a small pan over medium heat until most of the liquid is absorbed, about 3-4 minutes. 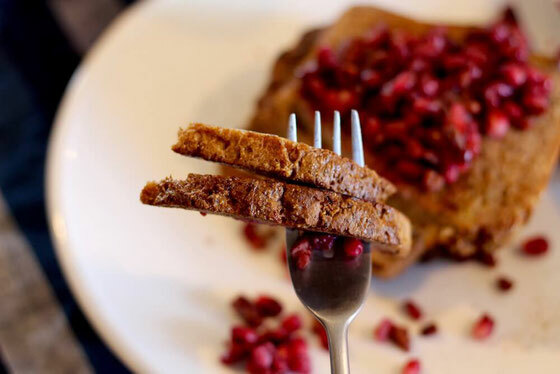 Top French toast with pomegranate-pecan mixture, and dust with remaining nutmeg. Serves 3. What are your thoughts on this topic? What are your favorite ways to eat pomegranate?